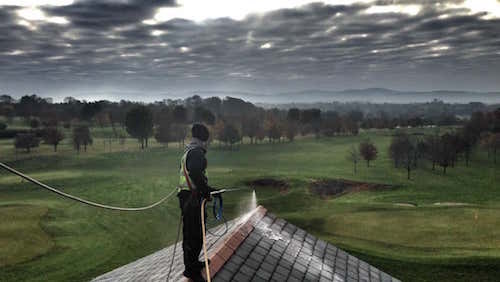 Roof cleaning in Stoke on Trent area by specialist roof cleaning tradesmen for cleaning concrete tiles, clay tiles and slate tiles. Using a "Clean and Protect" process we can keep your roof clean for up to 4 years. Roof moss removal, lichen removal and algae all removed using a soft wash process. Stoke on Trent weather is wet and has high humidity but our products and the method of application has been well thought out for all our weather conditions. Roof cleaning carried out on concrete, clay and slate tiles is equally effective on all tile types. The algae, moss and lichen can all be removed and all the products I use for roof cleaning are eco friendly and bio degradable to keep you, your pets, your plants and the environment safe and clean. We are roof cleaning specialists only - NOT roof re coating or any other addons, so no pressure from us to do more than just roof cleaning! See the service award on the right and click on it to read our reviews. Recently returned to England from Australia this business owner shows that he runs a great operation with loads of 5 Star reviews. 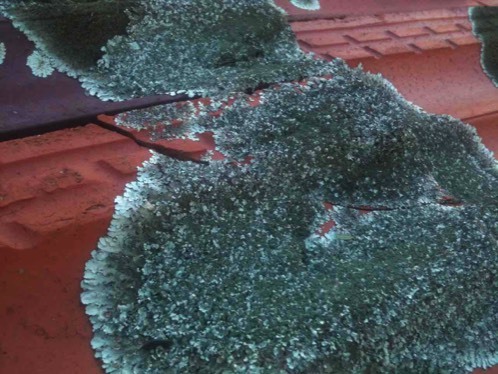 Roof biofilms are a complex mix of dirt, lichens, algae and fungi. Its invariably difficult to establish what the main colony is composed of so its often the best procedure to treat for the worst case scenario. Usually the most difficult biofilm inhabitant to remove is lichen. A thorough soaking is required. Enough biocide is applied to soak the roof ensuring that the overlaps between the tiles is flooded. Most roofs are a black colour comprised of grime, black lichen and metabolites. Metabolites are a by-product of fungi that grow on roof tiles. 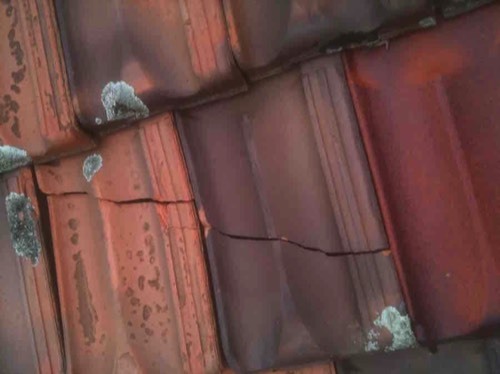 The fungi feed on the minerals (bio mineralisation) in the roof tiles and secrete a substance like a sunscreen to protect them from the sun and to help them colonise even more territory. Metabolites are really tough to deal with. The fungi is killed off easily, but the metabolites may require a second treatment of an alkaline gel or spray. In about 6 months they will fade away as the natural action of the weather will wash dead bits away. Self cleansing is important to the overall process of biofilm removal. In other words it gets better with time. If you've got the slime, we've got the time ….! "